"Si�n" (pronounced Sharn) was built in 1963 for the Fairbourne Railway in Wales. She was named after the 15 year old daughter of the railway's solicitor, who was a close friend of the railway owner. The design was almost the same as a loco called "Katie" which ran on the railway at Dudley Zoo. They had both been designed in 1951 by Ernest Twining (who used to work for the model engineer Bassett-Lowke). Both engines were built by Trevor Guest Engineering Co. of Stourbridge, who made other locomotives for the Fairbourne Railway. 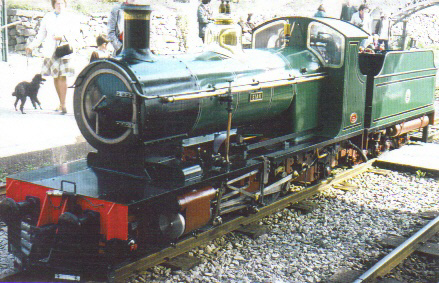 Both locos were painted Mid green with indian red frames, although shades varied from year to year. "Katie" was also bought by the Fairbourne Railway in 1965 and both locos were the main motive power on the line until 1984. 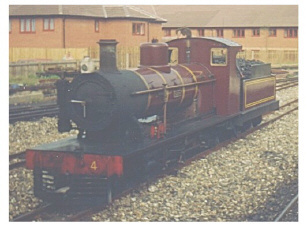 Under new ownership in 1984, "Katie" was sold to Haigh Hall near Wigan. 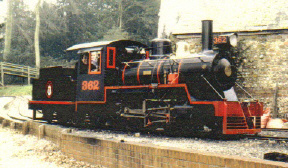 "Si�n" was heavily rebuilt into an American outline steam engine called "Sydney" for the 1985 season. It was then sold to Littlecote Park in Hungerford, Wiltshire. The Fairbourne Railway is now a 12 �" railway. When the railway at Littlecote closed down in 1990, "Sydney" was up for sale again. Si�n visiting Ravenglass in 1976. This was when Si�n first impressed the Ravenglass crews because she "ran like a sewing machine and used an absurdly small amount of fuel". A consortium of Ravenglass and Eskdale Railway volunteers formed a group intending to purchase the loco for use at Ravenglass. Unfortunately, the newly built Bure Valley Railway in Norfolk were desperately in need of motive power and outbid the Ravenglass consortium. Whilst at the Bure Valley, "Sydney" was altered into a more conventional outline and painted maroon. It was renamed "Si�n" again, although it was not to the original design. In 1994, the Bure Valley Railway had built their own locomotives and they decided to sell "Si�n". The Ravenglass consortium was already set up for purchasing the loco, and so the sale went through quickly. A clause of the sale was that the loco should remain on the BVR for 1994. By this time, "Si�n" had passed through three owners in the space of ten years, none of whom had a long term interest in "Si�n". As a result, the loco was worn out and needed a lot of mechanical work as well as cosmetic improvements!